Manager Grant McCann is backing out-of-form Tom Nichols to come good in a Peterborough United shirt. 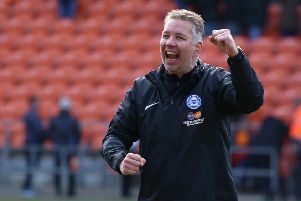 Nichols has failed to score in his last seven Posh outings after scoring four goals in his first five appearances of the season. Posh are becalmed in mid-table in League One ahead of Saturday’s (October 1) trip to Southend, partly because of a failure to convert enough of the many scoring chances they create. But manager McCann said: “I have a lot of confidence in Tom. He’s a very good footballer. “His scoring record was good at Exeter which is why we signed him. “He is still playing well in general play. He moves well and links up play well. Teenage striker Deon Moore is Nichols’ main rival for a starting place.